One Big Yodel: So American. So Swiss. Yodelers. Sorry for the gigantic Pause. Sorry. The Frau has been busy. Oh, busy too? How American of her. Ahh. The Frau hears herself being so American and she can’t stop it anymore. Oh well. Despite being oh-so-American now after almost, yes, three years back in the U.S., The Frau is still up to her Swiss ways too. Earlier earlier this month she was running around Switzerland doing research for a couple of projects, including a piece about a very special festival in Interlaken, which ran in the Financial Times a week ago. 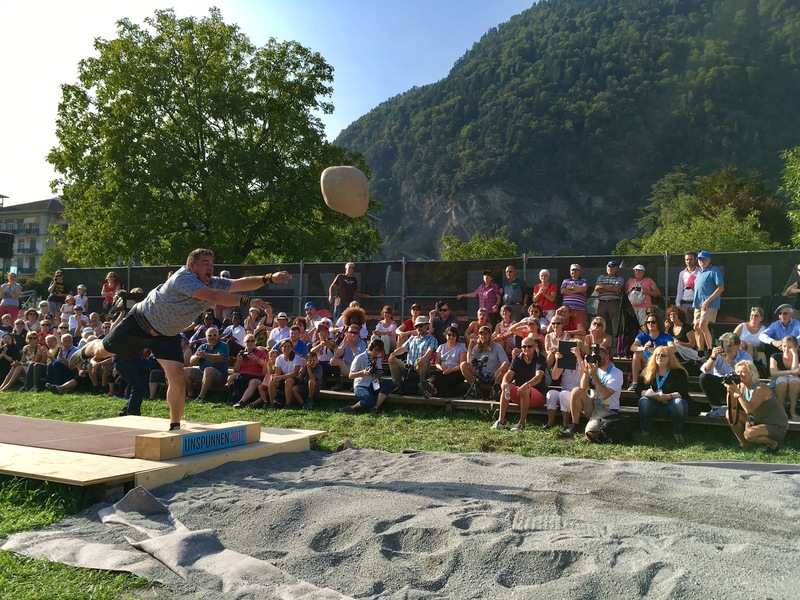 The big news (if you don’t have time to read the FT piece) is that The Frau threw a big boulder at a Swiss festival called Unspunnen. This festival, held only every 12 years in Interlaken, was amazing because it was the first festival that really allowed anyone—yes, even tourists like The Frau—to not only witness Swissness, but to participate in Swissness. Because here’s the thing—watch something at a festival and you might take a picture. Participate in something at a festival and you’ll tell a story about it instead. Thus, the boulder throwing. 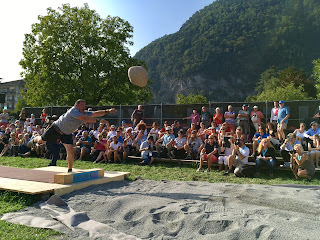 Throwing a gigantic stone is one of three traditional Swiss sports (along with Hornussen and wrestling) so at least now The Frau has a claim to Swiss sporting fame. While she didn’t volunteer to throw the 184-pound boulder (she could have though, you know, Swiss personal responsibility and all) she did throw a 30-pound stone—wearing sandals, no less. During her trip to Switzerland she also biked the Albula Pass (you must do this next year, Yodelers, if you haven’t—the SlowUp makes it easy by closing the road), hung out in St. Gallen, Appenzell, and Schaffhausen—you know for research purposes, and saw a few friends too. It’s still hard for her to come home to America after Switzerland, at least the America that’s going on these days. But someone has to try to make it a better place, and The Frau continues to try, this year by taking a leadership role with her local citizen’s council. 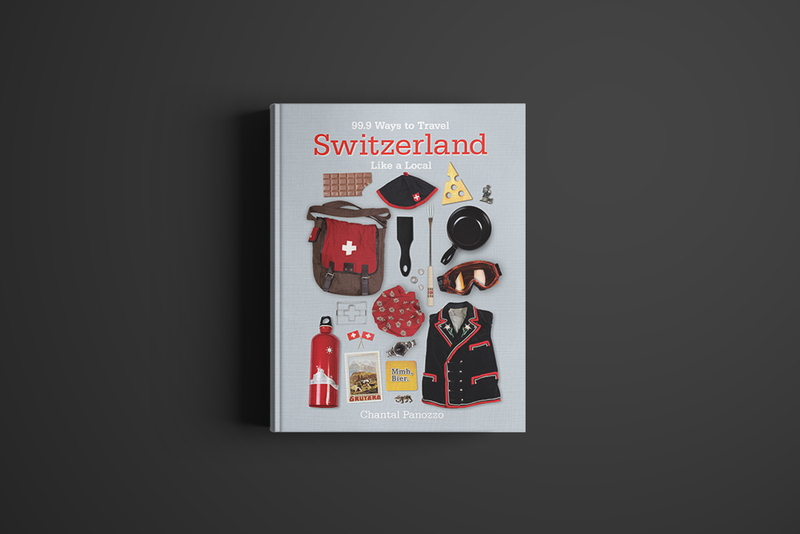 And in the meantime, there’s book number three to finish, all about American life after Switzerland—in other words—American Life: 30 Things I Wish I’d Known. And boy are there a lot of things The Frau wishes she had known about her own country. Way more than 30, but now the fun part begins of choosing exactly which 30 to highlight. Stay tuned. 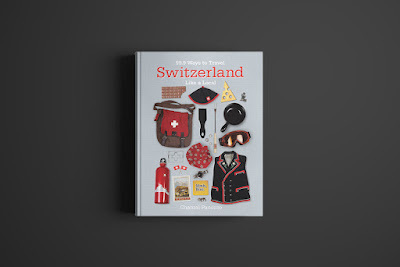 And if you haven’t check out book number two: 99.9 Ways to Travel Switzerland Like a Local—it’s filled with un-touristy ideas for the upcoming fall and winter. And it's in black and white now too. Our stay in Switzerland was similar timing to yours. Moved there fall of 2006 and 'home' to the US July 2015. Totally get it! If you need help whittling that list down to 20, I'd be willing to peruse the list. America today is not the America we left in 2006. God bless you for always being there to cheer and to guide. We are pleased to offer you the company of Hors to install a repellent pigeons and birds in Riyadh, a very excellent company and have a great experience in the fight against birds and pigeons and the work and the implementation of those metal engines on the ideal is working to expel birds and escape is not killing because most of them are for decoration and education So that you can get rid of all the smells and residues that leave them when they are on the building and a farewell to the presence of birds on the windows and the outer walls of the house. love the way you represent the article,keep posting. hokidatang.com is a Poker site We provide interesting online game variants. You can access all of these games practically using just one account. Hire a hacker to help protect your children from cyber predators. Our professional hackers can find the source and help close the case on any investigation. Hire a Hacker! Everyone loses a password at some point. We help crack/recover passwords from computers, mobile & wireless devices, E-mail accounts, FaceBook and more! Hire hacker! Has your Facebook, Twitter or Google+ account been attacked by a hacker? Do you need to get back into a social media account? A Professional Hacker Can Help! Any email is hackable and we can get in and recover your passwords. Hire a professional hacker to recover your personal data. Hire an Email hacker now! Our professional hackers can encrypt any data and help protect sensitive information from any other hacker who might try to hack your systems or yoir devices. Hire a hacker now! No matter what your hacking need, we can get it done in a professional and timely manner. With round the clock support you can reach one of our Ethical Hackers or our staff quickly and get your project started. Öğrencilerin hayallerini süsleyen yüksek puanlara sahip bölümleri sınavsız ve puansız olarak sunan Odessa Humaniter üniversitesi bölümlerine sadece lise diploması ile başvuru yapılabilir. Hem teknolojiye uygun hem de yenilikçi üniversitede lisans bölümlerinin sayısı oldukça fazladır.